In 1906, the Dakota Mutual Life Insurance Company was founded in Lead, South Dakota. 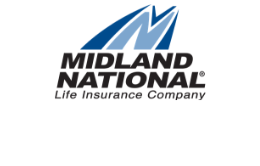 You can read the details of the founding of the company that became Midland National. Less than a month after the founding, the directors of the company decided to relocate the company to Watertown, South Dakota. Among the new officers elected at that December 8th Board Meeting were two men who would help shape the company that would become Midland National for decades to come. 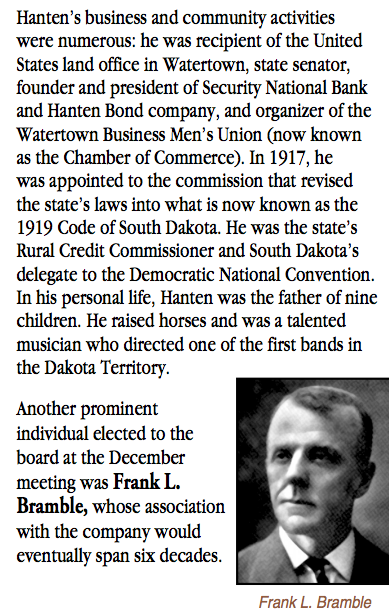 First was John B. Hanten. Mr. Hanten was elected president, a position he held for 19 years, relinquishing it only to become Chairman of the Board. Originally a homesteader and farmer near Kranzburg, South Dakota, Hanten accumulated large landholdings in the area. He moved to Watertown studied law, and was admitted to the South Dakota bar in 1892. 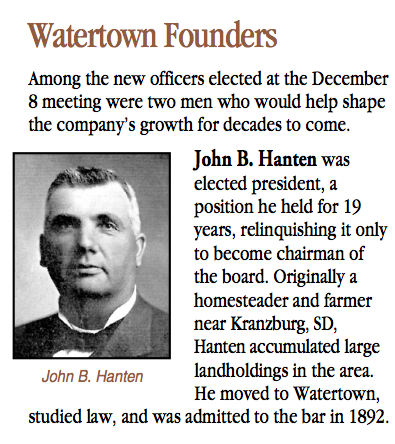 John Hanten's business and community activities were numerous: he was the recipient of the United States land office in Watertown, State Senator, founder and president of Security National Bank and Hanten Bond company, and organizer of the Watertown Business Men's Union (now know as the Chamber of Commerce). In 1917, he was appointed to the commission that revised the state's laws into what is now known as the 1919 Code of South Dakota. He was the state's Rural Credit Commissioner and South Dakota's delegate to the Democratic National Convention. In his personal life, Hanten was the father of nine children. He raised horses and was a talented musician who directed one of the first bands in the Dakota Territory. Another prominent individual elected to the Board at the December meeting was Frank L. Bramble, whose association with the company would eventually span six decades. To read the full set of posts about Frank L. Bramble and his work at Midland National, visit the "Frank Bramble" tag page.